Introducing our Spinster Tire Swing. This swing is made with a recycled automobile tire. The tire is sealed with a special paint to provide years of entertainment for everyone. Our Spinster tire swing incorporates a unique design feature. 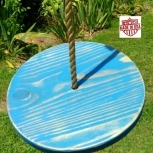 This feature eliminates the typical eye-bolt used by other tire swing retailers. Instead of the eye-bolt, the rope goes through the sidewall and is secured with a wooden block and knot in the rope. This allows for the swing to be easily leveled if necessary. The swing also has spinning hardware included for hours of spinning fun. 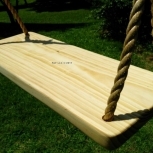 The rope used on this swing is polypropylene that is UV protected for longevity. Once this swing ships it is ready to install. $36.00 USD ($36.00 USD when combined with another item) by UPS.